How much longer can his weekends get? Campaign Thursday and Friday. Golf on Saturday. Then a day of rest before getting back to campaigning. Oh, please. He's one of the most hardworking Presidents in recent history. Do you even know how many vacations Bush Jr. had taken by this point in his presidency?? Precisely! But you're wasting your breath and energy with the likes of "John." Better to channel your intellect and enthusiasm by volunteering for the Obama campaign. We need to get our voters to the polls in November! And as we all know.., a few long weekend trips on Air Force One is much less expensive than a week at Marthas.., right Dan? Need I say more than 77 trips to the Crawford Ranch at $226,072 per pop. The biggest mess this country (which is currently in economic recovery mode) could face is a Gordon Gecko presidency. From a calendar based on publicly available information from the campaign, the RNC, the White House, and news accounts regarding GW Bush's travels in September 2004. The other states GW Bush visited in September 2004 included New York, Wisconsin, Iowa, Missouri, Michigan, Nevada, Minnesota, Alabama, Maine and Texas. Bush traveled every day in September 2004 except for 7, when he was either at the White House (1 day), Camp David (1 day), Kennebunkport (2 days) or Crawford (3 days). The righties will once again plug their ears to the truth, instead soaking up the usual anti-Obama lies from Fox and Limbaugh. You'd think the Repub "base" would get tired of being bamboozled; but then again, the GOP knows how to keep them scared and ignorant, poor saps. Actually, George Bush was campaigning reading My Pet Goat to school children on 9/11. Wonder if that was counted as one of the 29 trips to Florida. that means taking the girls out for a bike ride, an ice cream. Dine out with Michelle, among all other responsibilities of the nation. Just little things that a regular family can do on routine basis. For the President, this is luxury. According the idiot teathugliklans posting here; the president should be a captive prisoner with a chain on his ankle...just because they lost the 2008 election and their choice wasn't again appointed by SCOTUS. So this president is cleaning up the biggest mess ever created by the biggest failure of a president for the last 80 years. SCOTUS would have done us all a big favor had they not appointed that mess in the first go-round. It is amazing what a disaster this administration has made out of this country. All indications point to a recession at this point. What they have done spending billions has not worked. Anyone who thinks it has needs to wake up for the good of the country. These crazy libs are trying to make a bad guy out of Romney. Every other day CNN posts a headline that leans left, like today about the Mormon Faith and how it will sway Romney. Romney has been successful at everything he has done. He is what this country needs now. Obama is truly a scam artist. I am sure he learned it from his community organizing days working with Acorn and his corrupt union buddies. Dear John, Romney and the GOP return to complete power control of this country would be the most devastating clash of cultures and economic class distinction this country has ever seen. However, I do suppose that yourself being a member of the 1% cannot see beyond your entrance gates. Those unruly people known as the 'middle class' and the 'underprivileged' classes will surely embrace your upper status so that someday if they kiss enough butts, go to the right schools, marry the right person, and work for the right bosses they will become like you, a successful American icon. If you tell me you are not one of those people, then give your head a shake opening your mind to the future, not the past. Lay off the kool-aid Michael, reality is much better for you. Lay off of the con moonshine Kool-Aid police, it's killing your brain cells. @Isgyr108 Kool-Aid Police doesn't have brain cells. lol romney has been successful at everything he has done? Is that why MA was the 47th state in regards to economic health when he left as gov'r? There's a recession "at this point"? We were headed into one before he became President! You can't turn around 8 years of fail in 3-1/2. You got that right!! We're probably going to need at least 10 years to fix the mess Bush and his administration left behind. It took us 20 years to recover from Reagan, I can only imagine how long it may take to recover from Bush. Where were you when Bush was taking all those vacations to his ranch, or other past presidents taking vacations? How do you think he/they got there...walked or do you thing they took commercial flights?? @John obviously you get on here and post lies without even checking the top news article on this site. Regardless of the current week of power outages...I agree with the Poll that states Economically we are in a serious recovery. I can drive no more than 3 miles and count 14 new commericial and retail buildings going up. Sometimes it is hard to get from here to there with all the street and highway construction in this area. This is the most new retail construction in our area that I have seen in 11-12 years...and certainly the most street/highway construction during the last 3 years that I have seen in 15 years..
Ha! You lie like a fish swims, 24/7/365. Actually I never lie...lying mean you have to waste valuable time remembering lies you have told. I just tell it like it is and let the chips fall where they may ... but then you can't handle truth. FYI- Old people like me can handle the truth. Where I Iive we are in a serious recovery...the stimulus worked. During the period of the last 3.5 yeas roads have been rebuilt, 5 new schools have been constructed and two school were renovated and revamped, and one college campus has added a local branch. This country doesn't have a problem. Only you do. Problem is you don't know what the h....you are talking about. The President works more than spiderman, rescue the country from blink of financial collapse, rescue the auto industry, created 4.3M new private sector jobs. American technical advance is the envy of the world. Keep going, the President has turned this titanic away from the iceberg. Good grief, half of the people still in deep sleep. Maybe they could join the Romney's at their lake front home in New Hampshire.......maybe get in a little jetskiing. That would be real nice, and not cost me, the taxpayer, a dime. But that would also be soooo unObama.. But, you are so okay with Romney taking a $77,000.00 tax deduction for his wife's dancing horse hobby. How generous of you. 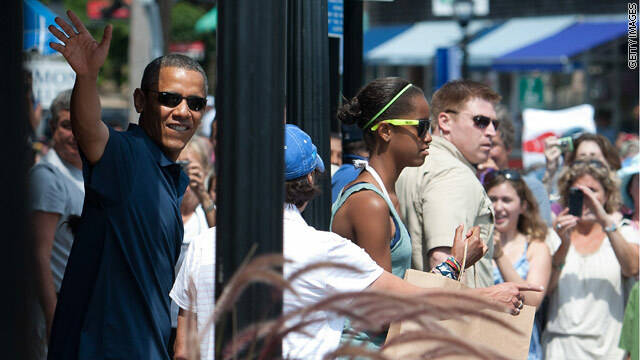 All presidents take a vacation – get over it. And, by the way, don't blow your fingers off trying to light your firecrackers. You are really tired of paying taxes on your cigarettes and beer,...that's it, isn't it? Start smoking the firecrackers you bought at the 'POP-UP-FLY-BY-NIGHT FIREWORKS OUTLET' down the street from your house and drink the stuff you brewed from donkey poop. There, you just screwed the gov'ment. Problem solved. @ John: Really?!? This administration has made a disaster of this country? Where you hibernating between 2000 and 2008? Those with incredibly short term memories like you are the ones facilitating the disaster of the country, by voting for mo.rons and i.dio.ts that reflect your views. @@Tee John (and a few others) would like to try to rewrite and redate the historical facts of the Bush failed presidency. This might be the last chance, before trip back to Chicago. Wishful thinking on your part. Sorry. The white house has spent $17,963.04 at Staples this year. Obama bashes Bain yet buy's the products, what a hypocrite! Maybe it's cheaper than Office Depot. and saves taxpayers money. The Office of Budget and Management bulk orders supplies for the White House to cut expenses. I'm sure they price every bid to the lowests bidder. But in the whole scope of things $17,963.04 is not a large amount in sales for any office supply source considering the volume needed for the White House..
Koo-Aid. IF and ONLY IF you can find 10 items are made in USA, otherwise shut up. Look at yourself, from head to toe, what is made in USA? Fear not, this family is all about taking vacations on our dime. They will not be vacationing inside the border of the United States yet again this year. They will be vacationing in England this year. Just watch, they shall be there on our dime vacationing and watching the Olympics. CRYBABY REPUBLITARDS: THE PRESIDENT IS TAKING A VACATION! WHAAAAAAAAAHHH!!! One would think Camp David would be sufficient. Besides Mama Obama is going to the Olympics so part of the family will have a nice vacation at tax payer expense. Mrs. Obama is representing the United States of America for our atheletes...just like Laura Bush represented the United States of America for our athletes at the Torino, Italy Winter Games. Whine someplace else....loser....you are soo lame. It's all good practice for his big vacation come November. NO WORRIES BECAUSE AFTER HE WINS THE ELECTION IN NOVEMBER, HE, MICHELLE, THE GIRLS & BO, WILL BE OFF TO HAWAII FOR THEIR ANNUAL 2 WEEK HAWAIIAN VACATION!!!!!! AND SAYING TO MV.......SEE YOU IN 2013!!! !